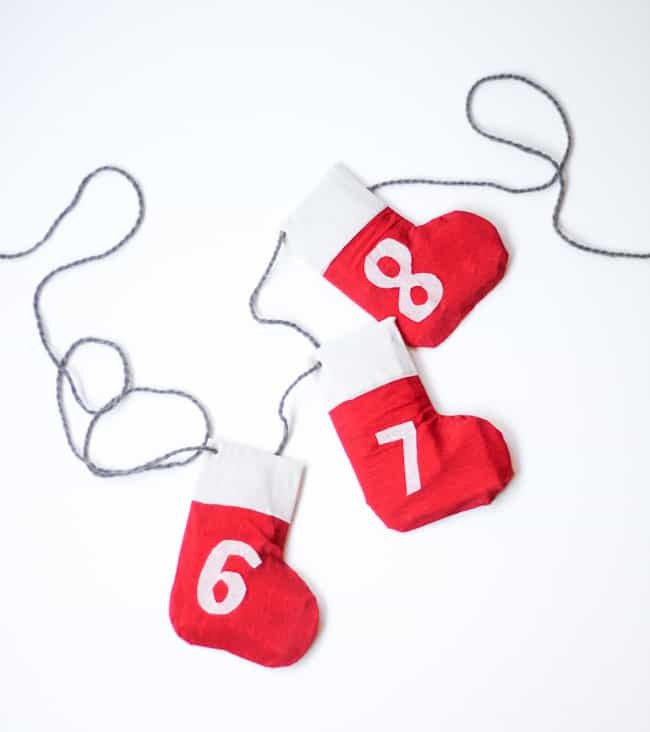 I am so excited to be bringing you this Stocking Advent Calendar Garland. Because we have such a small apartment, I have to keep my holiday decor to a minimum to not overwhelm our space. 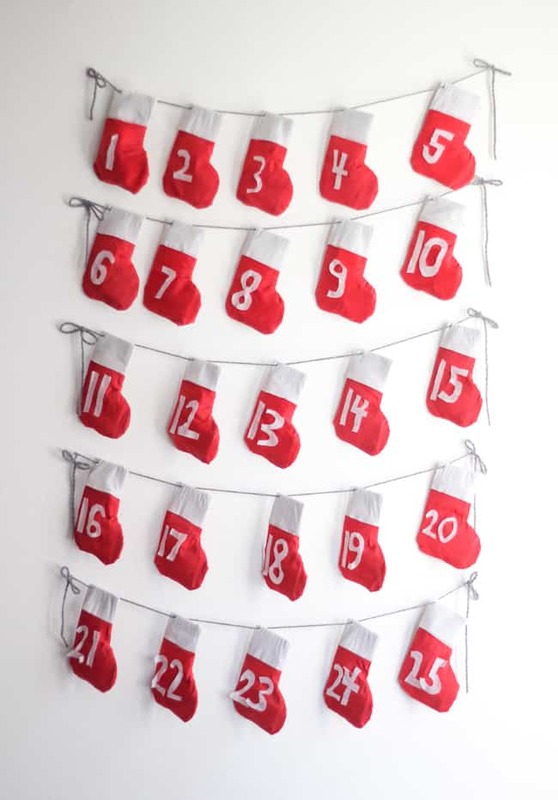 This Advent calendar is perfect because it it’s bright and festive without taking up too much space. And even though this project took a while to make, about three hours total, I’m really happy with how it looks in our home (even if it is a bit early!). 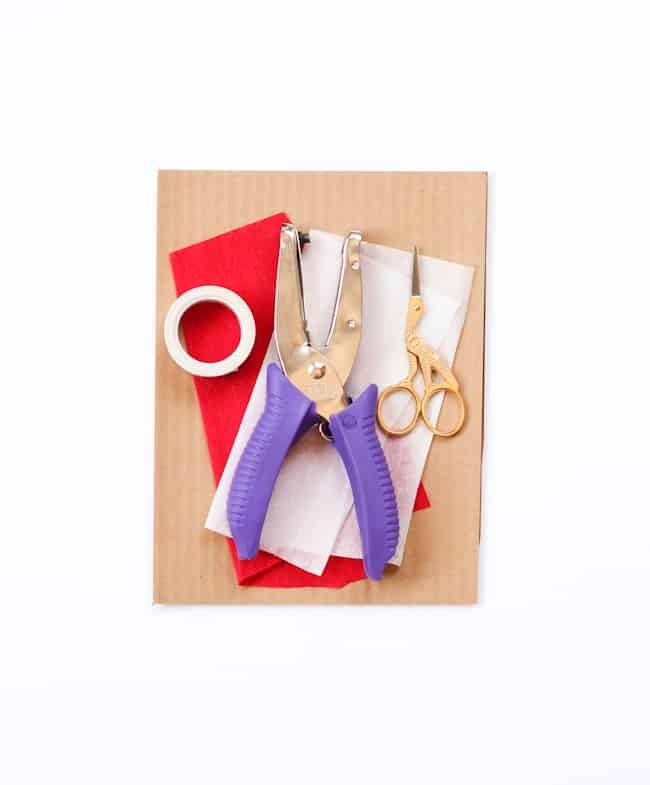 Draw your pattern on a piece of cardboard and cut out to make your stencil. 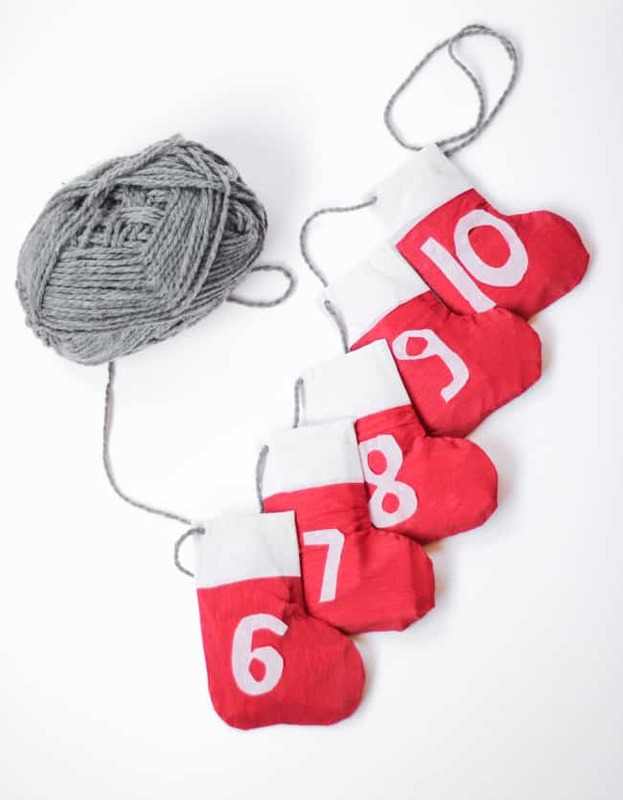 If you’re not great at free handing, Google image search as several stocking images that would make great patterns. 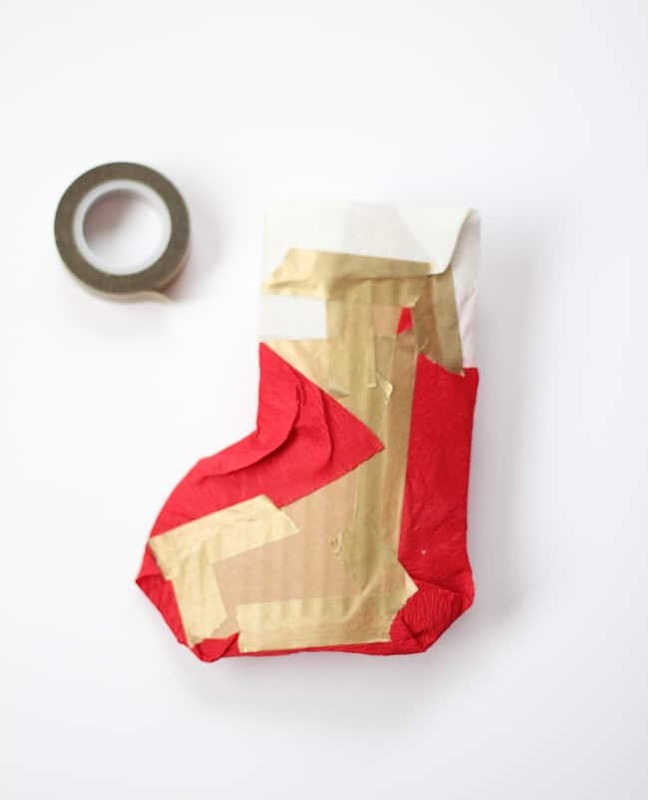 Trace your stencil on the remaining 24 pieces of cardboard, making sure all the stockings face the same direction. 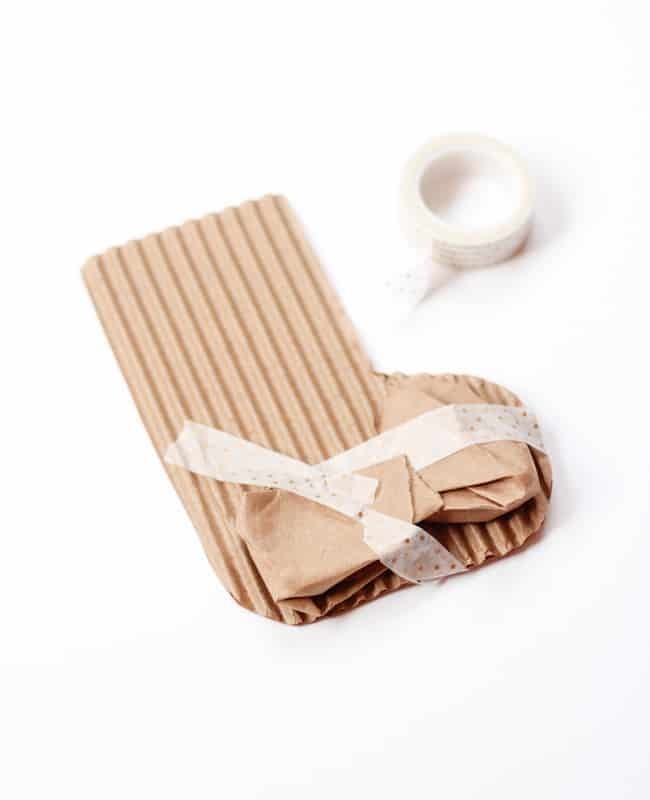 To give your stockings shape, fold up kraft/scrap paper and tape to the base. 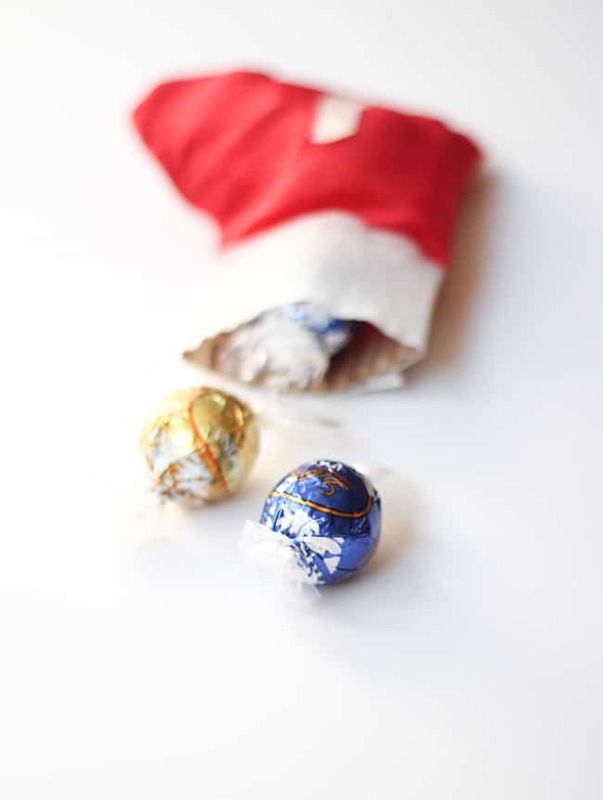 The shaft of the stocking should remain open to fill with candy and goodies. 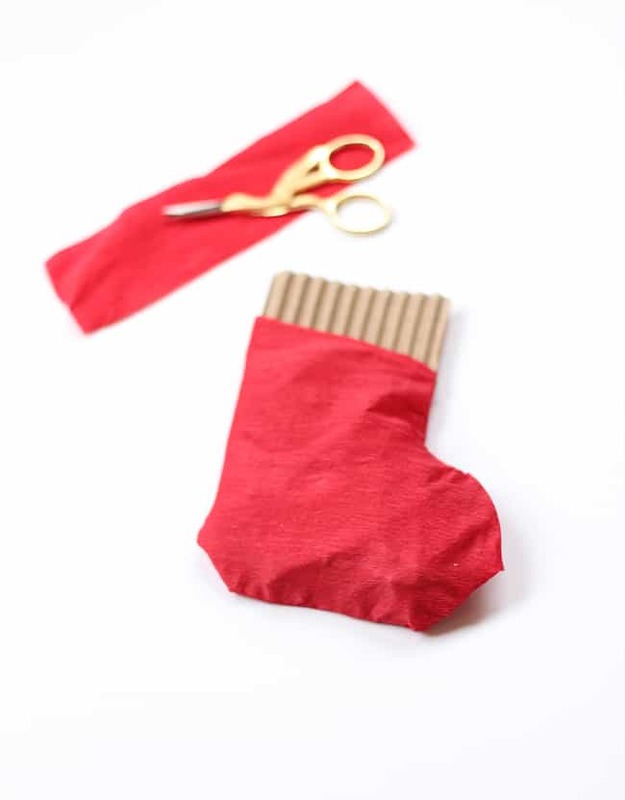 Cover your stocking with a layer of red crepe paper and secure with tape (on the back). Leave a bit of space at the top so the red doesn’t bleed through the white. 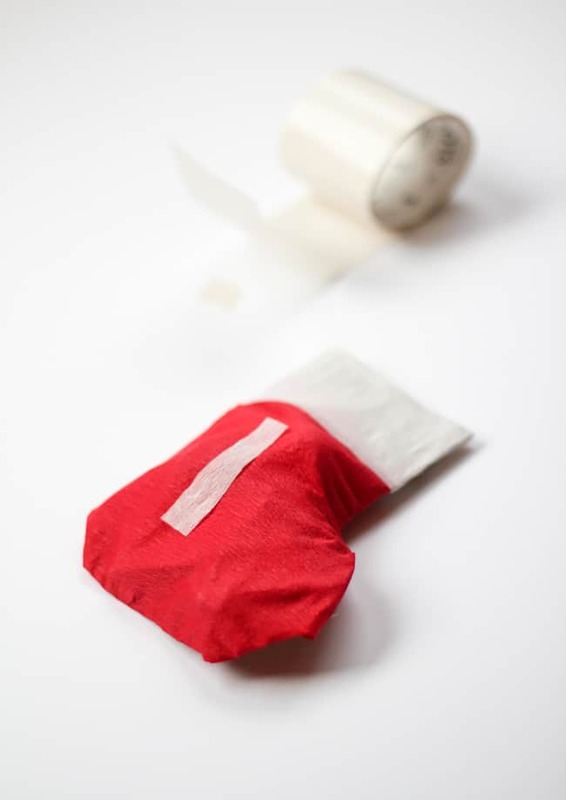 Fill with your goodies, then seal your stocking with a layer of white crepe paper. 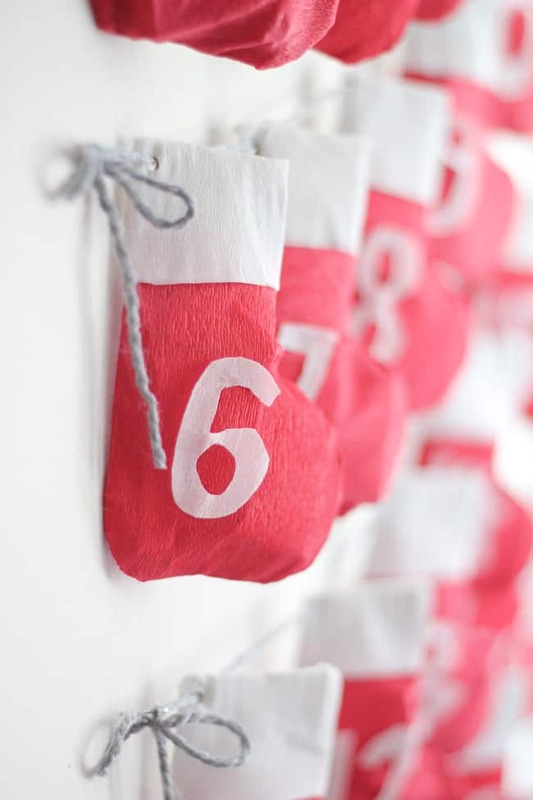 Cut out your numbers and secure with dots or a glue stick. If you’re short on time I recommend buying number stickers! Punch a hole in the corner and string up with yarn. Display by tying yarn onto nails. So that is my first Advent calendar! I can’t wait until December when I actually get to open it up and enjoy all the goodies stashed inside. 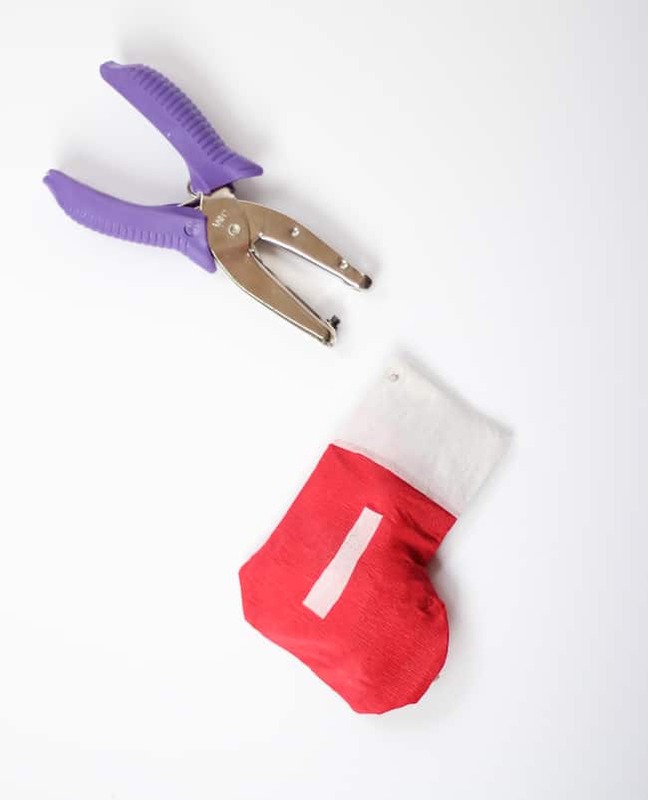 To enjoy, simply cut down from the garland (without cutting the yarn) and open the the white crepe paper. 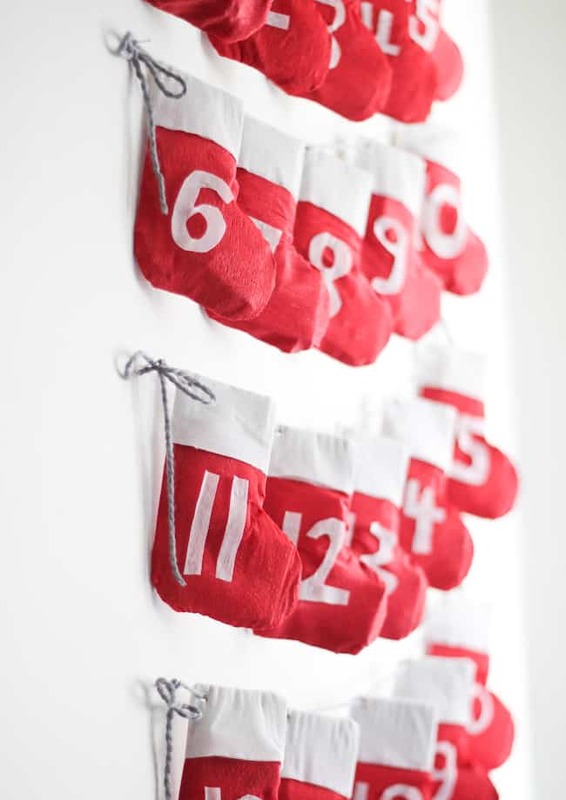 Will you be making an Advent calendar this holiday season? Adorable idea! We are booking this for our baby’s first Christmas next year!